Hello? Is this thing on? It's been a long, long, LONG time. Oh how life has changed. The good thing is that I feel like it's moving forward again now instead of stagnating and stuck on repeat! I'm hoping to ramp this thing up again and start posting on a regular basis. Next time - I'll tell you what I've been knitting! Now that the song is running through your head - I give you a current WIP. Labyrinth Sock out of the fabulous "Socks from the Toe Up" by Wendy Johnson. Ravelry tells me I started this sock on May 16th. It spent a lot of time riding around with me being ignored but taking lots of rides in the car.... I pulled it out of the bag 2 days ago finished up the gusset increases and knit half the leg - I finished it up last night and it's ready to be worn if it only had a partner. Please do not think that my taking 3 months to knit 1 sock is by any way a disparagement on either the book or the yarn. 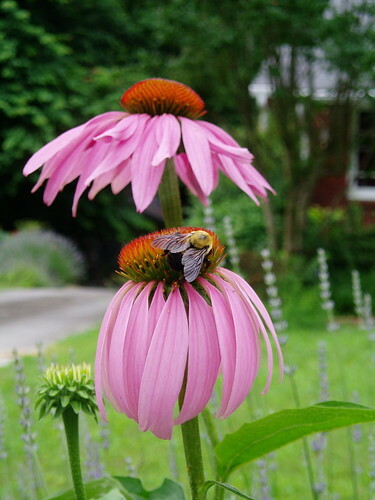 I just found some other things to work on (Girasole - I am talking about you!) and sewing :) Maybe the 2nd sock won't take so long! Oh - it's Lorna's Laces Shepherd Sport in Iris Garden knit on my handy Addi's size 2. So this week there is no sewing going on at the house - why? It was past time for the sewing machine to have a cleaning and tune-up! 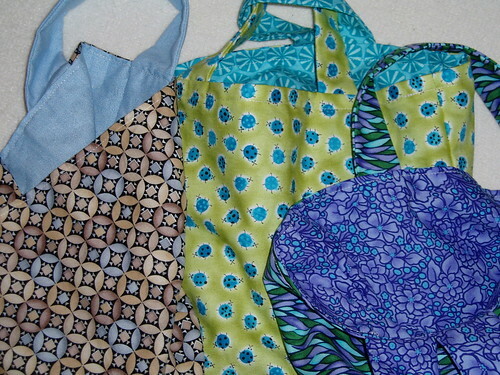 I finished sewing up some bags and then packed up the Elna to take over to Intown Quilters (see link on the side-bar). They have a deal with a local place that does cleanings and repairs on sewing machines. I haven't heard from them since I dropped off my baby so I'm hoping that everything is going along well with the cleaning. 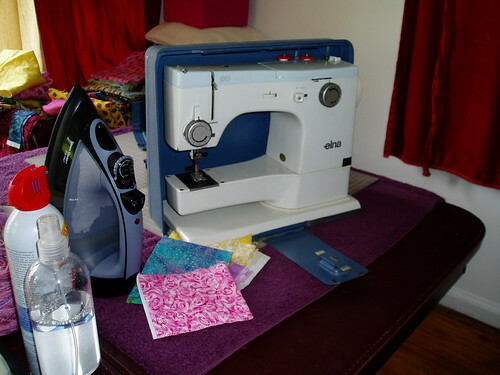 My elna was my mothers' - she gave it to me several years ago and I've loved sewing with it. When I took it in to IQ one of the ladies recognized the carry case and then praised the machine - she had apparently had one years ago and loved it :) I had been a bit nervous about dropping her off, but with those comments I knew everything would be OK. So instead of filling my day with sewing I've been trying to do some other things around the house - I cleaned a bunch of stuff out of the office - YAY!! And Sunday evening I did some cooking... I'll do a separate post for that because I have a bunch of photos to go with that post too. I've been keeping myself busy making bags and even getting a little bit of knitting. 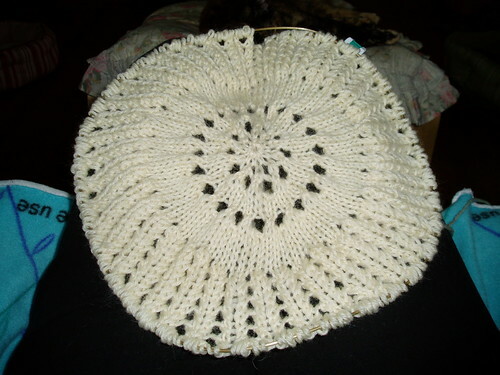 My girasole is coming along slowly - up to 640 stitches around so each row takes a bit of time. I made hummus today as we're having a "greek" geek night tonight and I thought I would post my mom's "secret" hummus recipe for everyone. This is an easy recipe and makes really good hummus. Drain 1 can garbanzo beans and reserve the liquid. Pour the other can including juice into your food processor. Add salt, garlic and tahini into the food processor and turn on. Add the lemon juice to help with the blending. Process until smooth. Taste! Add more lemon juice if needed or the extra garbazo juice if it's too thick. That's it! So easy and good! Substitutions - you can sub peanut butter if you can't find tahini. Also while processing, you can add more garlic if you like or black olives or roasted red peppers to make a different tasting hummus. Use pita chips, carrot sticks, celery sticks or just use a spoon to eat! I've been pretty busy since I opened up the etsy shop (and even busier since WendyKnits blogged about my bag!) So not much knitting has been going on here - just bags, bags and more bags! And I do tell people that I'm owned by cats so they know if they're allergic. Here's Joon "approving" of the most recent batch of fabric. Don't worry - I had just brought the fabric home and was taking photos - now they're off to the wash and then I'll make some more bags! Wheeeeeee! I've been spending time (and my fabric stash) sewing sock knitting project bags. They're approximately 8" deep and 5x5" across the bottom. Here are a few photos of the finished products. And I've opened up an etsy store where you can view even more photos and purchase the bags! It's OliviaKnits of course! I am planning on making some zippered bags and larger totes as well but since the sock projects are near and dear to my heart I started with those ones first. I started 2 new knitting projects and spent today sewing little project bags! First the knitting - I'm participating in a knit-a-long hosted by Sheri over at the Loopy Ewe. It's for the Jared Flood pattern Girasole. I'm knitting the blanket size using Lion Brand Fisherman's Wool in Natural. I've finished Charts A & B and am halfway through Chart C.
The next new project - well... it's a SEKRIT. But I have a pretty placeholder photo from outside my house. Now - onto the sewn bags! I have a stash of fabric that I was telling you about when I was making those pretty aprons a couple of weeks ago. I've seen some really cute project bags that friends have brought into the knitting groups I go to and I've seen some other cute ones on blogs I've read. So, I decided to take up my stash and make some cute bags and I will be selling a few too - cause I haven't found a job yet and I've got to work with what I have (make that stash WORK baby WORK!). All of the bags I made today are roughly 8.5 inches tall and 5x5 across the bottom and are completely reversible. They have 2 handles - and the longer one tucks through the short handle. The bags will hold a cake of sock yarn with room to spare!